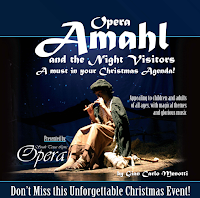 Fully staged with a live orchestra, the story centers on Amahl, who is a poor, crippled shepherd boy living with his widowed mother. They encounter the three kings destined to visit the newborn Christ and through the course of the tale, the young boy is cured of his lameness because of his selflessness. At one hour in length and performed in English, the performance takes place on Sunday, Dec. 11, 2011 at 3 p.m. at the Rio Grande City High School Paco Zarate Fine Arts Auditorium located at 144 FM 3167 in Rio Grande City. General admission tickets are $20 and tickets for students and senior citizens are $10. 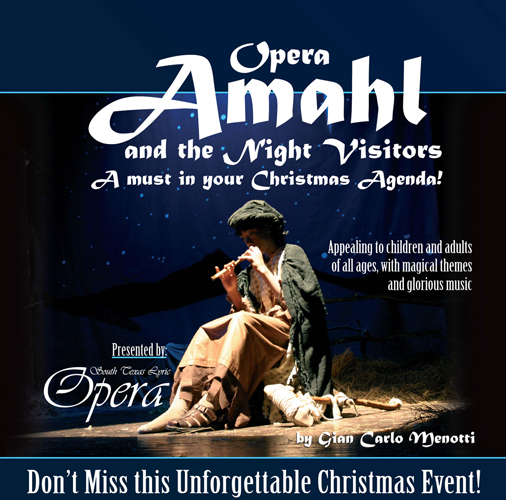 For more information or to reserve tickets call 956-735-4242 or 956-263-1573.